"Many people in the class are elderly and have physical limitations. They are not pressed to do more than they are comfortable with and it is all very friendly." Our Chair-Based Exercise classes aim to improve flexibility and fitness for people who prefer to remain seated, either on a chair or in a wheelchair. 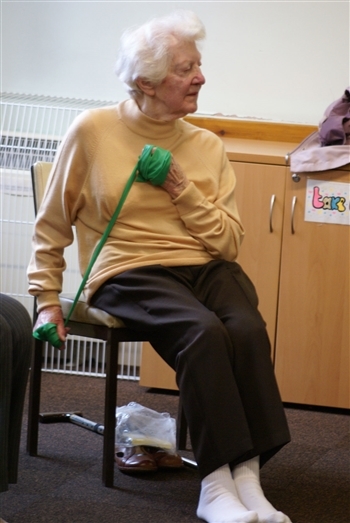 The classes are gentle and are particularly suitable for people who are less able. 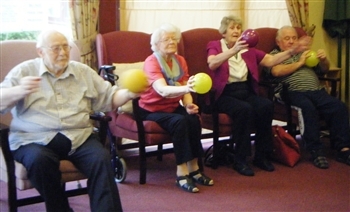 They offer the opportunity to exercise to music and to improve your limb mobility, muscle strength, co-ordination, balance and range of movement. The classes are set to lively music and use simple equipment such as balls, bands and hoops. The class starts with a gentle warm up, followed by exercises that work all parts of the body in turn, and you will be encouraged to work at your own pace and rest if you need to. Even your hands and feet will get a work out! The class lasts 45 minutes. At the end of the class you will cool down and then we hope that you will stay for a cup of coffee or tea and a chat. "My own health & condition has greatly improved since I have been doing this class." You do not need to bring anything with you, and you do not have to wear special clothes or shoes, although high heels would not be suitable. Ladies can wear skirts or trousers. We provide any equipment that is used in the class. If you use a wheel-chair you are very welcome to join this class, and the venue is wheel-chair accessible. Carers are welcome - but please join in! One of the class members provides the tea and coffee after class and will ask you for a small donation towards the cost. I love this class, it is the highlight of my week!"